Despite the credit crunch, falling solar module prices and the like, cleantech is still on track to be the next big thing, writes Steven Milunovich, Cleantech Strategist, Merrill Lynch. Clean technology is suffering from the credit crunch with deferred and canceled projects. Solar module prices now look to fall by 20 percent to 25 percent in 2009. Alternative energy stocks have cratered. The U.S. public policy front appears more upbeat with the election of Obama, but there are increasing concerns that his environmental agenda could be put on the back burner. Taking a longer-term view, however, we believe cleantech is the next big thing and that the application of technology to energy markets will provide investors ample opportunities beginning in 2010–11. Let's step back and put cleantech in perspective relative to previous technological revolutions. Our framework is provided by economist Carlota Perez in her book "Technological Revolutions and Financial Capital." 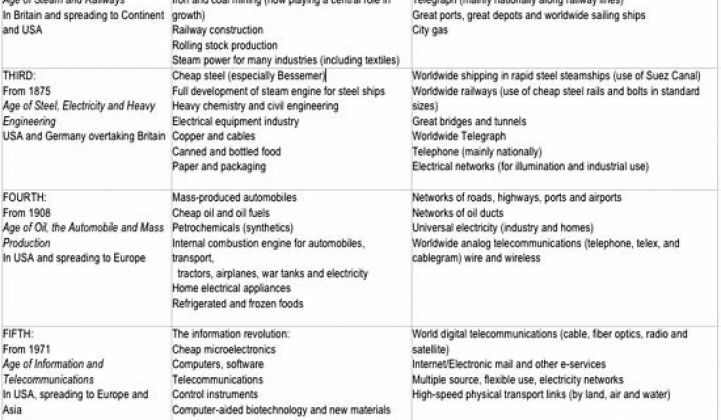 She identifies five great surges, arguing that technology revolutions occur about every 50 years (Table 1). The first was the Industrial Revolution centered in Britain from 1770–1830. The next three revolutions were the Age of Steam and Railways (1830–1870), the Age of Steel, Electricity, and Heavy Engineering (1875–1920), and the Age of Oil, Automobiles, and Mass Production (1910–1975). The fifth revolution is the current Age of Information and Telecommunications. She marks the beginning or "big bang" event as the 1971 launch of the Intel microprocessor. Earlier computing efforts (the transistor, mainframes) are viewed as a precursor to this disruptive event, which dramatically altered the economics and pervasiveness of computing. We believe the sixth revolution will be the Age of Cleantech and Biotech. Key foundational technologies could be nanotechnology and genetic engineering. Although government subsidies are needed today, cleantech could explode when pure economics drive adoption. Investors must pay attention because cleantech could revolutionize much of the economy, including the utility, oil and gas, and auto industries. History suggests that public market investors earn the highest returns fairly early in the revolution. For example, railroad stocks doubled in the 1840s frenzy but traded flat in the 1850s. Although biofuel and solar stocks are on the downside of their mini-bubbles, many cleantech companies have yet to go public, which likely will accelerate in 2010–11 coming out of the downturn. Venture capitalists will be an important catalyst to the sixth revolution. VCs have been a primary funding source of disruptive technologies in the computing era and are now bringing their smarts and experienced management teams to energy. Cleantech is becoming the third leg of the VC stool, complementing information technology and biotech. Many funds we've spoken with expect cleantech to become at least 20 percent of their portfolio. Some firms are applying their IT expertise to cleantech while others have partners with energy backgrounds. There is a good reason IT and energy executives are coming together. Energy observers Peter Huber and Mark Mills point out that the biggest change in the last few decades has been the emergence of the digital economy, permitting devices and systems that were impractical before. Solar PV is an obvious example of the application of digital technology to energy, but, as Nobel laureate and VC Arno Penzias points out, so are large transistors than can work in the world at human scale. Digital technologies were applied more easily to weightless information at the milliwatt level; now it's the turn of larger digital systems operating in megawatts. According to Huber and Mills, "The single biggest opportunity for more efficiency resides in real-time, dynamic control of complex systems, from commercial buildings and engines to factories and homes." That's a job for silicon, software, intelligent networks, and other digital tools. It is early days for cleantech, a time at which venture capitalists can have real impact. Ray Lane of Kleiner Perkins said, "I think that energy is in the same stage that technology was in the late-1980s. There's no Internet. No client/server. Corporations weren't looking to venture capitalists to see what is going on, they were looking to IBM, Sun, and Oracle. It was only during the 1990s that enterprise customers became more concerned with venture capital investments. The same is happening now in energy." Indeed, though a near-term shakeout looms, the cleantech era is just beginning.